It's been a while since I last updated. Sorry! I just started my new job up in Carlsbad last Monday and though I'm still in "training" mode... I've been putting in on average 10+ hours each day. I've been drained each day when I get home at night but its so invigorating and exciting to be working at a company currently in sort of a hiring craze despite the current state of the economy and with coworkers that constantly strive to better themselves intellectually. YAY! 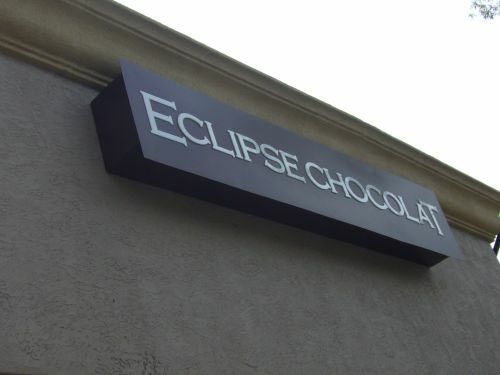 It was quite a treat to meet up at Eclipse Chocolat with fellow bloggers...an event that Will, the proprietor organized for us. Thanks Will! Hopefully this gets the ball rolling as I do admire and follow the blogs of these fellow foodies and have been looking for an opportunity to meet them. We got to sample desserts on Will and discuss matters ranging how to to better your blog down to what's on your ultimate black list of restaurants. 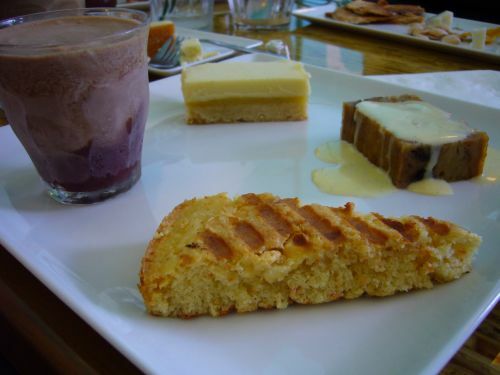 It was a tad early in the day for dessert so I wasn't able to finish my tasting. I did really like the Carrot Gâteau though. It was slightly buttery, with little specks of carrots and there was a nice crispiness from being toasted. Roger already beat me to the review of the event so you can read the lovely review on his site and live vicariously through the pictures. Hey Liz! Great to meet you at Eclipse! We'll have to meet up again some time soon. Good luck with the new job! Holy crap I can't believe you put in 10+ hrs/day at your old work. That's...madness! I'd probably pass out on the drive back home. Nice concise post on the EC event. Dude I want in on the restaurant blacklist convo! Sounds like a helluva lot of fun. Anyway, seems like a few of our fellow bloggers are down for another get-together. I'm going to try to organize one...standby for an email! Thanks and again it was nice to meet you too. It takes a lot of will power to stay awake on the drive back down from Carlsbad. But I still love the job! Got the email invite last night and thanks for organizing the event. The carrot gateau was the close second of my favorites on the dessert platter. I agree that the grilling helped to accentuate the flavor. Unfortunately real life does gets in the way of blogging. But your job does sound exciting and it's nice to be in a new and challenging environment. Good luck and remember to eat! Thanks! It's been a little tough to get back into the working grove again but I'm hanging in there. Hope you can come out next time we meet up.